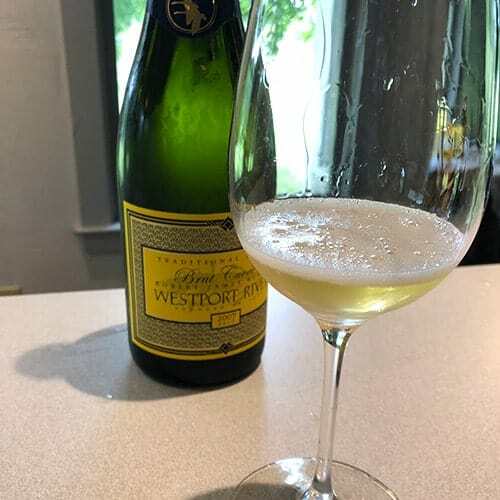 Westport Rivers Winery produces high quality sparkling and still wines. 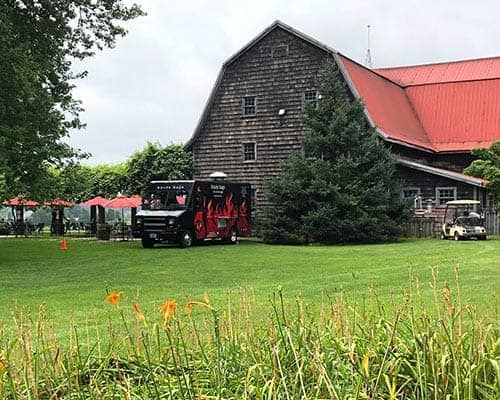 This Southeastern Massachusetts winery is a great place to visit! After having a great time visiting wineries in Abruzzo this spring, I was motivated to visit more wineries closer to home. Only problem is, New England is not a hotbed for good quality winemaking. I’m only interested in wine made from grapes, so that eliminates a number of local wineries making wines from blueberries, cranberries and other fruit. Good news, there is a modest list of New England wineries making very good wine. Visiting Westport Rivers Winery in Southeastern Massachusetts is a good place to start appreciating our local wine. 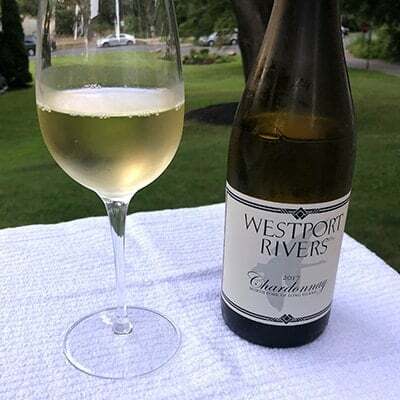 Westport Rivers Winery, located in a town by the same name, is just over an hour from Boston and 30 minutes from Providence. So perfect for a day trip, although it would also be a pleasant area for an overnight. Turning off the highway for a late August visit, I drive for a few miles through gently rolling terrain with waving tall grass, farms featuring rows of corn and houses with backyards that look perfect for a whiffle ball game. Soon I spot the sign for Westport Rivers Winery, and turn onto the gravel road. I see a large weatherbeaten barn, which I learned houses the winemaking operation. 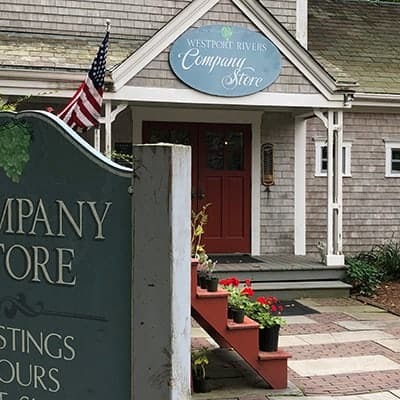 I pull into a spot and head for the Westport Rivers Company Store, which is the spot for tastings and a tour. 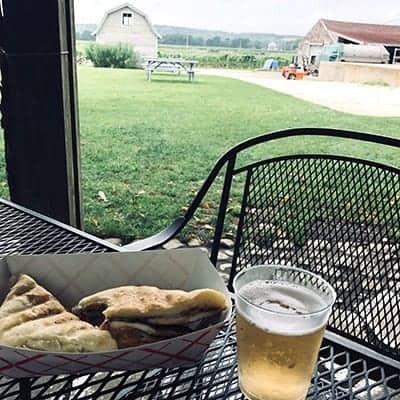 Westport Rivers Winery is open Monday through Friday. Public tours of the vineyard and winemaking operation are available at 1 and 3 p.m. daily. For $10, you get to taste an array of at least 6 wines. Wines are available by the glass to enjoy on the patio. 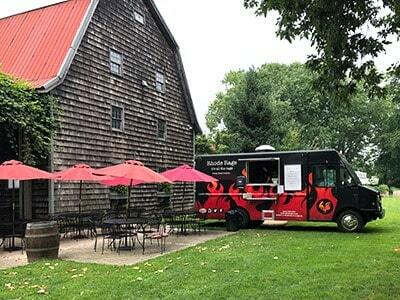 On Saturdays through October, you can grab some food from the Rhode Rage food truck. For more information on seasonal events like summer concerts and fall hayrides, visit the winery website. While it is common to do a tour and then taste the wine, I planned my visit to start with a tasting around noon. I then picked a favorite from the lineup to get by the glass to enjoy with lunch from the food truck. I relaxed on the patio with my sparkling wine and sandwich, then went on the 1 p.m. tour. My approach is a good way to roll if you want to give the wine some time to settle after the tasting! 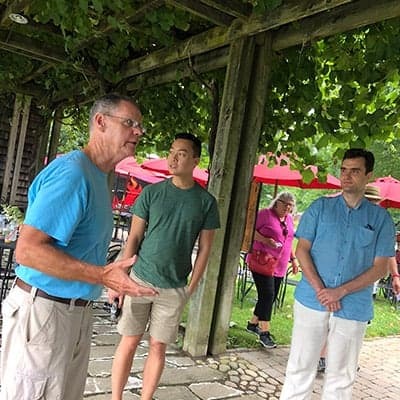 The tour provides a look at the grape vines, which were showing some good fruit during my late August visit. Then you go into the wine making barn for a look at the winemaking process. Westport Rivers Winery was founded by Bob and Carol Russell out of a desire to return to the wine business that Carol’s father and grandfather loved. They were looking for a spot to make excellent sparkling wine, and picked Westport in 1982. The first vines were planted in 1986, and the winery opened to the public in 1991. The Westport Rivers sparkling wines have a well-deserved reputation for excellence, and they have over time developed a range of still white wines, rosé and red. I’ll touch upon some of the Westport Rivers wines I’ve sampled in the next section. 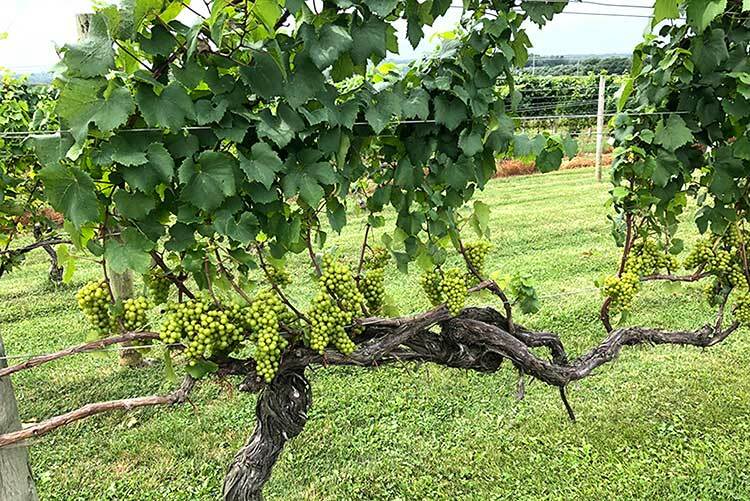 Westport Rivers Winery now has 80 acres of vines producing wine, making it the largest winery in New England, according to the company website. Learn more about the Westport Rivers Winery story on their website. As I mentioned, Westport Rivers Winery has a special focus on sparkling wine but also makes some good still wine. At the winery tastings, you get to sample a lineup of at least 6 of their wines. My notes on Westport Rivers wines below are based on a combination of the sampling I did while visiting plus other bottles I have had at home. I signed up for the wine club when visiting, so I will be adding to the list from time to time. The wine club is a good resource for discounts at the winery, as well as getting a quarterly shipment of wines. 2007 Westport Rivers Brut Cuvée ($30): A classic dry Champagne style sparkling wine. This vintage bottle gives a good example of the level of quality achieved by the Westport Rivers sparkling wines. I enjoyed sipping it in the tasting room, and ordered a glass to go with my lunch on the patio. 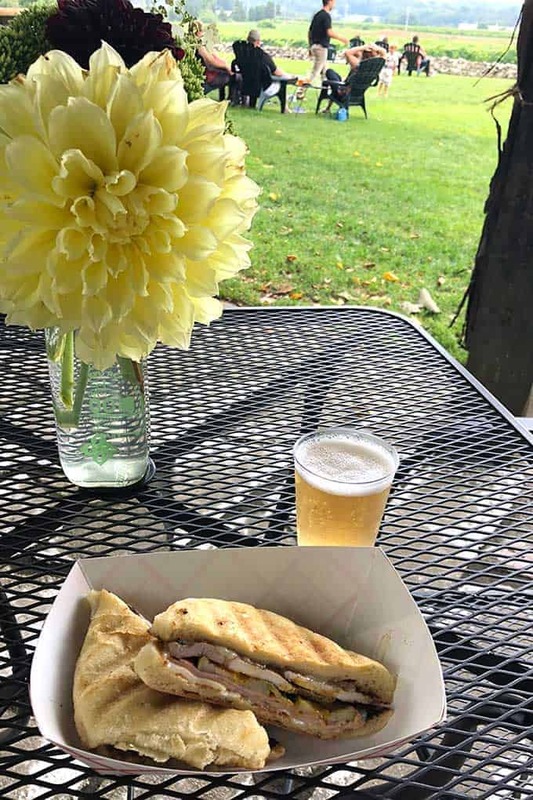 Definitely pairs well with the Cuban sandwich available from the Rhode Rage food truck! See our 25+ Pairings for Sparkling Wine for some more pairing inspiration. 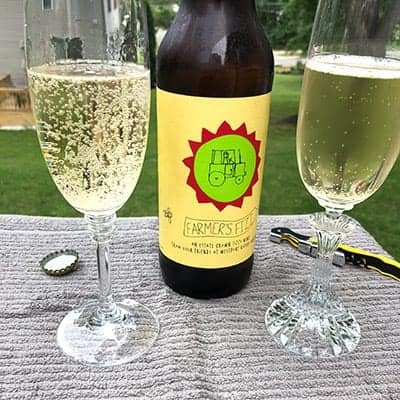 Farmers Fizz Sec ($17): I really like this Prosecco style sparkling wine! The bottle looks like a large craft beer, with a top that needs to be popped off with a beer bottle opener. This one is made from mostly Chardonnay with a bit of Riesling for balance. 2017 Cinco Caes ($20): This still white wine blend was the first in the tasting lineup when I visited this summer. Fruit forward, pleasant drinking wine. Rkatsiteli is one of the main grapes in the blend, not something you see too much of around here. 2017 North Fork Chardonnay ($23): Almost all of the Westport Rivers wine is estate grown. One exception is the 2017 North Fork Chardonnay. After a particularly tough New England winter, they needed to partner with a Long Island supplier for Chardonnay grapes to make the 2017 vintage wine. I get lemon fruit and creamy mouthfeel on this wine. Definitely made with some restraint, in contrast to the overoaked Chards that I try to avoid. 2016 Pinot Meunier I was excited to hear when visiting that Westport Rivers produces single varietal Pinot Meunier. This red grape is most often found in a Champagne, but I’ve had a chance to sample some interest still Pinot Meunier. 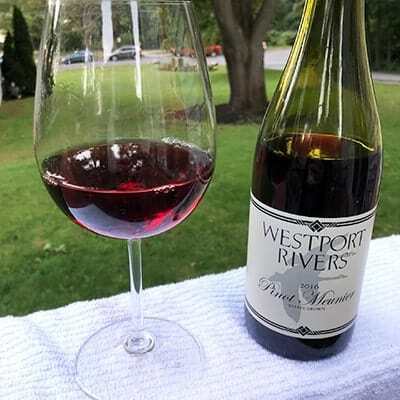 The Westport Rivers Pinot Meunier is a very light red wine, yet it packs a lot of flavor. Blackberry fruit, spice and a distinct smoky element. It paired fairly well some mushroom risotto, but I think it would be ideal with something involving bacon! Maybe a turkey burger with bacon, or chicken marsala? I need to get another bottle to experiment! 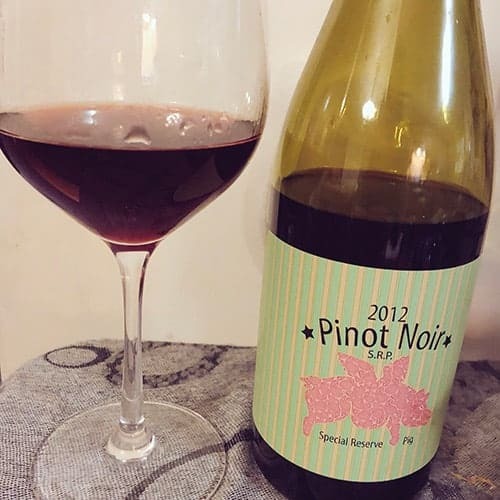 2012 Pinot Noir SRP ($30) Tastes a bit like an older Burgundy—fruit has dropped off a bit, showing some toffee and brandy along with a bit of cherry. SRP stands for “Special Reserve Pig”– not sure the backstory on that one! An interesting wine; the Westport website indicates it is sold out but perhaps you might be able track down a bottle if you want to sample what a New England Pinot Noir can taste like.